Elijah Young is proof that wishes can come true. When Elijah was little, he added a secret wish to a special book his grandparents had gifted him. The book was like a diary, with pages dedicated to hopes and dreams. Elijah Young speaks out for transgender people. Picture by Louise Firli. Elijah added the words, “I wish I was a boy,” in his eight-year-old handwriting. He says although he was born a daughter, he always felt different on the inside. “I knew from when I was very young, I just didn’t know there was a word for it,” he says. Much has changed for Elijah in the past three years. He finished high school, moved from Bright to study paramedics at Bendigo’s La Trobe University and began transitioning from female to male. It’s an ongoing process that started with legally changing his name in June last year. 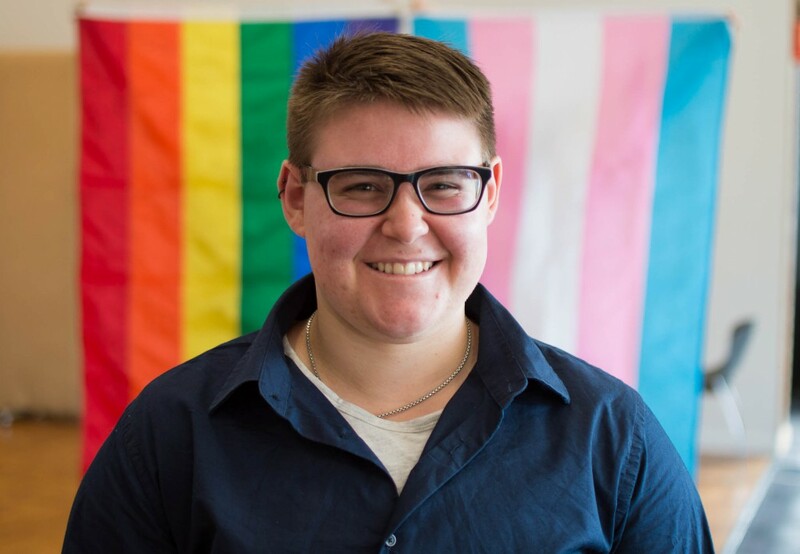 This month Elijah watched proudly as for the first time the university raised the transgender flag for Pride Day, an annual celebration of the uni’s GLBTIQ community. The pink of the flag represents femininity, the blue masculinity and the white neutral. “It was really good,” he says on seeing the colours fly high over campus. The day included the launch of a new student club, Rainbow Eagles, with Elijah as a spokesperson. The club aims to provide support and social activities for GLBTIQ students and their straight friends. “I think it’s important to have our allies involved, so it’s not closed off,” Elijah says. Elijah says through the uni’s support services he’s been able to meet other GLBTIQ students. “There’s more than you would think there is,” he says. Elijah will openly tell you his story. Of coming out to his family and friends. Of having the courage to live life as his true self. “I’m a very open person. I think it’s in my family background, we’ve always been open about things,” he says. “Because I had a positive experience coming out and now transitioning, I haven’t felt any shame. I haven’t felt like it’s a bad thing. Elijah will qualify as a paramedic at the end of next year. He says in the meantime, he’s looking forward to being part of the Rainbow Eagles club while completing the last stretch of his degree. This story was originally published on ABC Open.